I am beyond excited to finally be able to show you the "after" pictures of our baby girl's nursery!! This will be a post of mostly pictures, because... let's be honest... it's all you really care about anyway =) However, I just wanted to remind you that I'm not really into the themed baby nurseries, therefore this is a horse nursery of a different color. Something that I envisioned and have always wanted for my baby girl. Something that she can grow into. My very talented sister-in-law, Brianna illustrated these 2 beautiful pictures! "Brynn" in Alphabet Photography. I know I told you this already but after seeing it in person, I love it! I love that it's not too matchy matchy and very sophisticated. it is gorgeous!!! you guys did a fantatic ob on it!! oh i love it! i kind of got filled up a little bit at the end imagining your baby girl in there. it's beautiful! Beautiful!! I love it all!! Great job!! I love it! It's so sophisticated and beautiful. You did a great job! It's amazing! I can't wait to see pics of Brynn in her nursery, but that would mean Jake will also be here and his room is not even close to being ready. I'm such a procrastiantor! wow it looks beautiful! the stripes turned out great! and I love her name blocks! very cute. LOVE IT! Especially the mirror! (if Connor had been a girl that was the mirror I was going to buy) and the Chest fits PERFECTLY under that window! I LOVE IT! I am doing a grey, black, and pink theme with our little girl! This is our second daughter and I went girly girl pink with out first and decided I wanted something different for our second! I love the etsy block letters for her name and the hot pink initial b. I think I may have to copy you! We just need to decide on little ones name before I make a purchase. Fab nursery!!!! It's gorgeous Jenni! 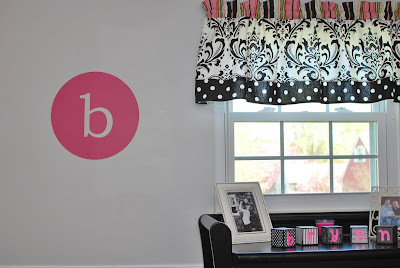 Love all the details - the b decal, the block letters, the rug...so pretty! Great job! Very classic and your right growing into a nursery is the way to go when you spend so much money on everything already! Congrats! Cant wait to see her! 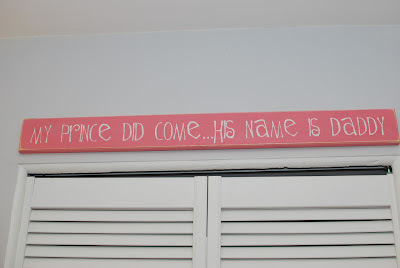 BTW-who was the seller on etsy that you bought your baby name blocks from? It's absolutely beautiful! I love it! Jenni- This room looks AWESOME!!! I am so wishing I had a little girl right now!! Jenni it looks awesome!!! I love the colours you have used and how everything came together perfectly!! Great job!! I have been MIA this week, but I just wanted to say thank you for the sweet comments!!! OMG! I don't know how I missed this post! 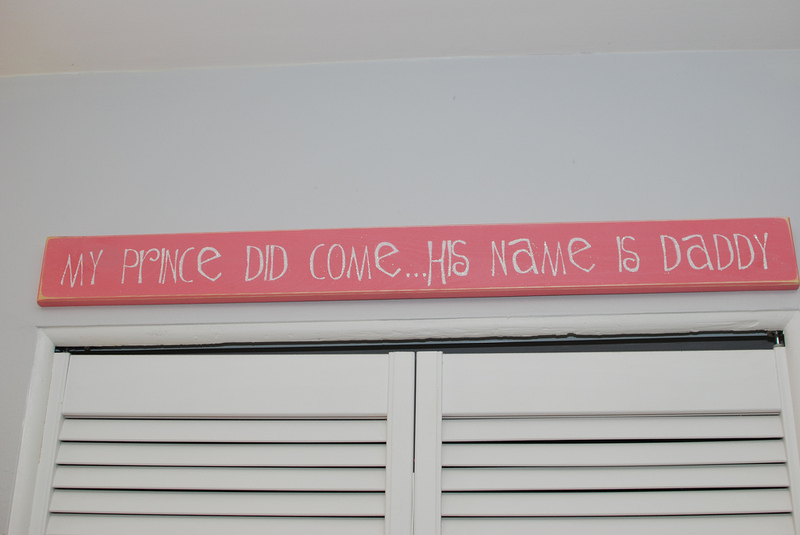 I LOVE Brynn's room! OMG! It should be featured in a magazine :-) You guys did a great job!!! I'm so jealous! 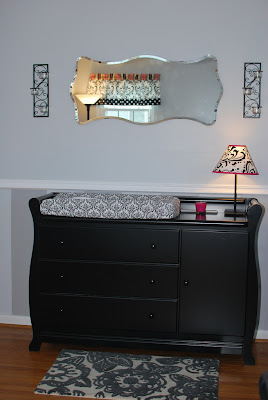 Im currently 5 months expecting a girl, & I have to ask is that a dresser used as a changing table or a changing table? Where is this furniture from? @ Anonymous- It's a dresser used as a changing table, I did the same for my son. We got this entire set from Babies R Us and it's the Delta SoHo Collection in black. Jenni~ Thank you I just logged on to show my guys how amazing your baby girls nursery is & noticed your year in recap & saw the link on the "unfinished" post.Thank you so much, dresser used as a changer is a great idea HAPPY NEW YEAR!!! I need that Babies R Us sign!!! 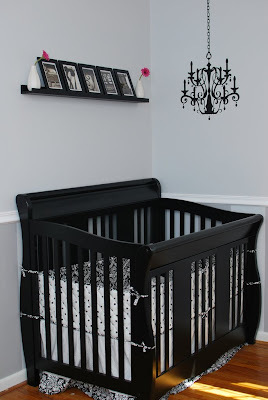 Just found your gorgeous nursery! Do you happen to know what color the grey is that you used to paint the stripes? Looks like the one I'm looking for! I have a couple questions about your gorgeous nursery! Did you just use the blue paint tape to do the walls? Did you use light grey and medium grey or is that white and grey? Do you know the names of the paint colors? 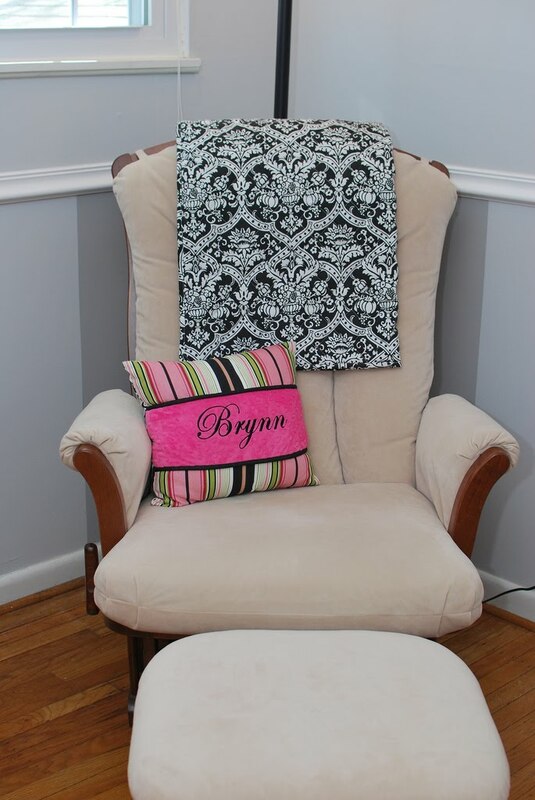 I am helping my daughter in law and she loves your nursery! Great room! Did you use the blue painter's tape for the stripes? Gorgeous! How long did you wait after you put on the sterling before you did the stripes?